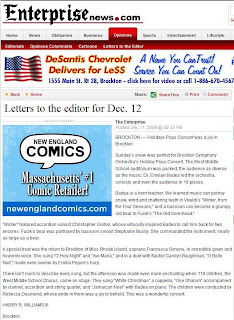 The [Brockton] Enterprise did publish my Letter to the Editor, posted Sunday night right after I emailed it to them. Their version omitted 70 of my 296 words. It was not a bad job of editing, and fully caught the flavor of my missive and of the concert. I was not surprised at their unwillingness to give any free "advertising" to our lead season sponsor, HarborOne Credit Union, but I express my gratitude for all supporters of the Brockton Symphony Orchestra at every opportunity.